I was delighted to give a workshop today at the annual meeting of the North American Cartographic Information Society (NACIS). These are folks with advanced knowledge of geographic information systems (GIS) and they make what I fondly refer to as “real maps.” There’s a wealth of mapping knowledge that has yet to make its way to the web and I hope some will fill that void. My thanks to Tanya Buckingham from NACIS for inviting me after she attended my workshop at Where 2.0. Hi, I'm Adam. 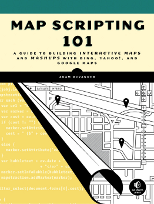 I'm writing a book about developing maps on the web. This site is where I'll share the things I find and help you create your own maps. Find out more. Wishful Mapping: Can I Give You a Book?